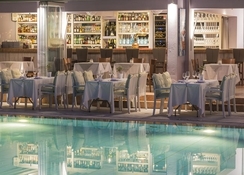 La Piscine Art Hotel is an adults only four-star boutique hotel, located in a peaceful area, just a 5-minute walk to the centre of Skiathos, offering an intimate and relaxed stay amidst calm surroundings to couples and friends who are looking for privacy. Featuring a pool and pool area with comfortable sun beds, the award-winning, a la carte Crazy Cow Restaurant, Olympic-sized swimming pool and an excellent location, the hotel offers an excellent choice of accommodation in Skiathos. Offering well-appointed 42 rooms and Suites, furnished with rich fabrics and modern bathroom facilities, the hotel makes guests feel at home during their beach holiday. The hotel located in a peaceful area, just a 5-minute walk to the centre of Skiathos, offering an intimate and relaxed stay amidst calm surroundings. 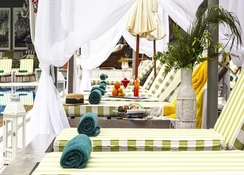 The hotel is in close proximity of shops and restaurants in Skiathos and its harbour. Guests will find plenty of excellent shops, restaurants and tavernas nearby. Offering well-appointed 42 rooms and Suites, furnished with rich fabrics and modern bathroom facilities, the hotel offers guests a comfortable stay option. Rooms come in types of Standard, Deluxe, Superior and Suites in Junior or Executive types. Rooms have shared or private balconies, quality mattresses and linen, air conditioning, desk and satellite TV. 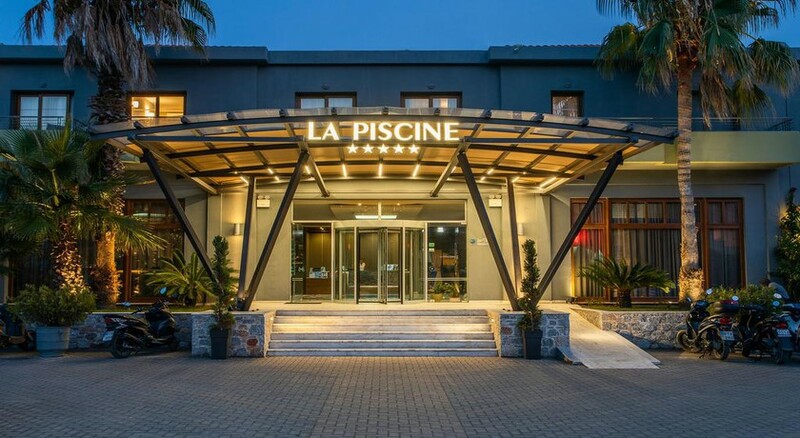 La Piscine Art Hotel houses the renowned Crazy Cow a la carte Restaurant which serves delicious European cuisine and is open for Breakfast, Brunch, Lunch and Dinner. Expert chefs prepare delicious local and international cuisine from the freshest ingredients. There is also the Crazy Cow wine bar for selected Greek and international wines. 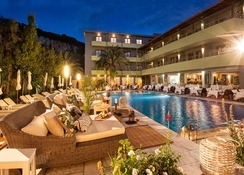 The hotel has a swimming pool and and terrace where guests can soak up all the sun. There is Yoga classes and a fully equipped gym for those who wish to stay active. There is a lovely spa offering massages and therapies. Beauty services are available upon request. The hotel has facilities for Cycling, Hiking and walking Tours. The hotel can organise diving, windsurfing and canoeing. There is lively evening entertainment and a nightclub too.